Chris was struggling a lot to concentrate in class and was starting to fall behind in school work. 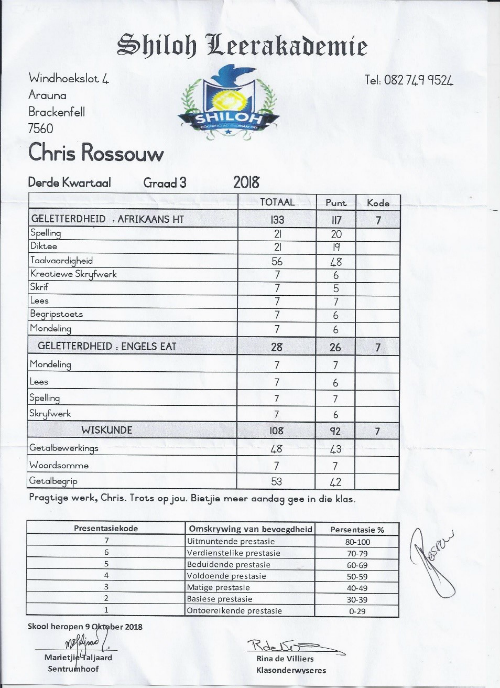 His end of year school report for Grade 1 wasn’t bad, with mostly 6 scores, but I was concerned because I noticed that he was struggling more and more to understand the work, which was reflected in a subtle decline in his Grade 1 test marks. His Grade 1 teacher was very kind and went out of her way to help and motivate him. She, however, said she was worried about his lack of concentration in class, and she felt that he needed help. In Grade 2 at Mikro he really started to struggle to keep up with class work. His teacher told me upfront that she would not go out of her way to help him pay attention because of the workload and the fact that her class is full. She warned that he would fall behind if we did not give him medication to help him concentrate. I noticed that his marks in class tests were starting to plummet. We decided not to follow the medication route due to the risks involved, and it was clear that without medication my child would not receive much support in class. We therefore decided to, even before the end of the first term of Grade 2, take him out of mainstream school and enrol him in a homeschooling program where he would receive more individual attention. 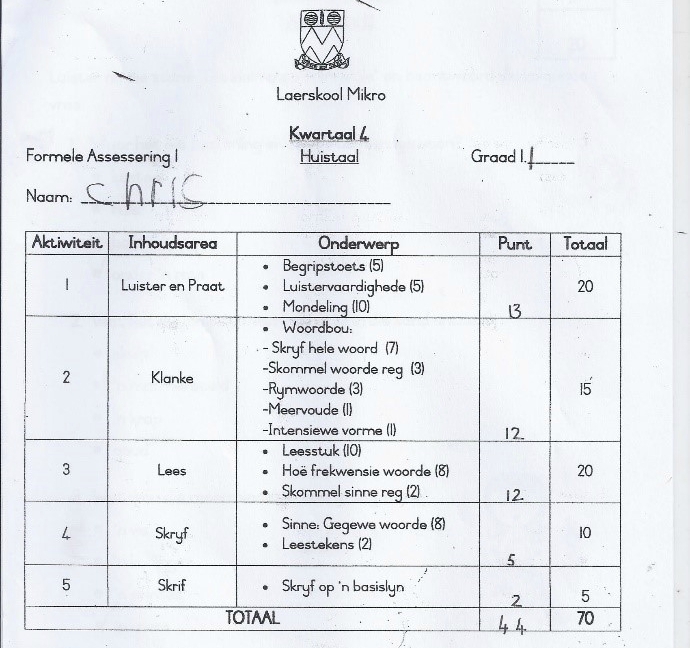 We therefore never received a Mikro report for Grade 2, but from his class assessment scores it was clear that he was on a downhill spiral. In terms of his motivation for learning and self-image he was at a very low point. He believed and said that he was different and not good enough, and often cried. He said he could see that other children were able to understand and do things in class that he couldn’t. At first he also experienced a lot of problems at the new school with concentration and listening to the teacher. 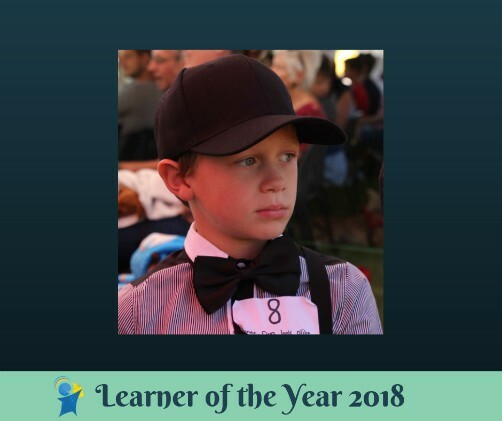 At this time, he also started attending Edublox, since initial testing at Edublox Durbanville indicated that he was lagging behind his peers in reading and memory skills. At his old school, and also at the new school, he used to hate to go to school in the mornings. He seemed nervous, irritated and tearful. He was not interested in learning new things and especially didn’t like writing. His reading was slow and he needed to re-read parts of sentences which he had skipped. He also didn’t enjoy reading much, and I noticed that sometimes he didn’t completely understand the storyline and how things fit together in what he had read. 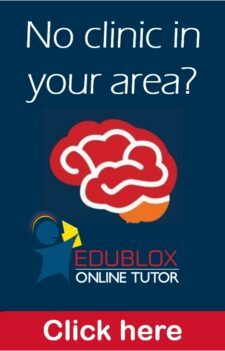 An evaluation at an educational psychologist in July 2017 (middle of Grade 2) indicated problems in his visual-motor skills (which affected his writing skills) as well as problems in short-term memory (which she thought might be making it difficult for him to focus in class). So, for the rest of Grade 2 we had an au pair who helped him in the afternoons, to make sure he had done his homework and understood the work. We also continued with physiotherapy and he consistently attended Edublox twice a week as well as an intensive Edublox holiday program in the October school holidays. We were much encouraged by his end of Grade 2 report, which looked good, but especially by his new motivation to learn and do his homework. The au pair was no longer available, but it seemed that her help was no longer necessary, because I noticed that he had started to do his homework by himself. 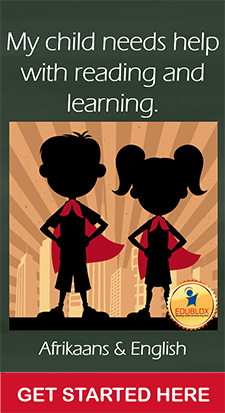 In Grade 3 we therefore did not have an au pair or physiotherapy, but continued with Edublox once a week because we had noticed the obvious improvement in his attitude and work by the end of Grade 2. I am convinced that the interventions we did were all necessary and it was very important that we did them before he could fall behind and lose hope completely, which I am convinced would have happened if we had not acted swiftly. I have noticed that Chris is happier being at school and is eager to learn new knowledge. He has especially started to read up on science and biology subjects and he is excelling in maths. He has started to develop his own ways of solving maths problems without much input from me. In the past, we used to argue every evening because he struggled to do his homework. Nowadays, I am seldom involved in his homework and if I am, it is usually because there is something small that he doesn’t understand, but when I explain he quickly grasps the concepts. I have also seen some improvement in his writing skills. His writing is still not perfect but definitely neater, which makes it easier to understand the ideas he is trying to convey. He has even started doing his own creative writing, without me having to be involved. When we read together at night he also reads much better and he enjoys reading the stories out loud. Chris is better at paying attention in class as can be seen from the fact that he is completing his work assignments in class and not bringing them home any more. He hardly ever completed work in class, and then those pages and pages of work would come back home. I then had to struggle till late at night with him to complete the work for the next day. 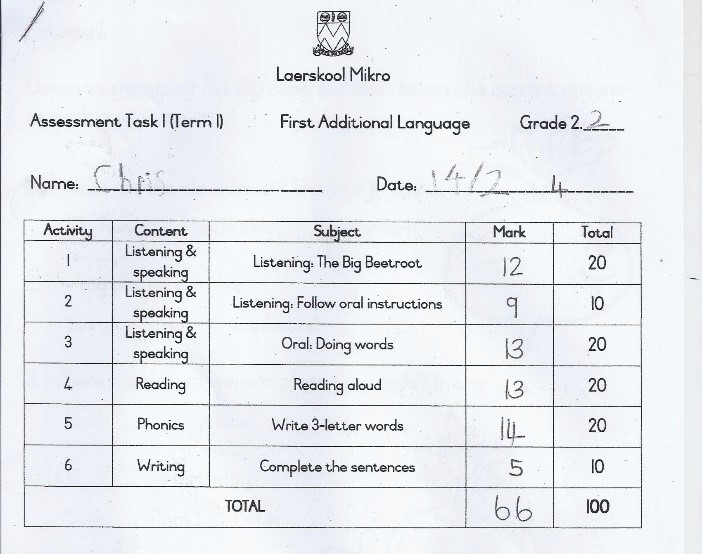 This has not happened at any stage during Grade 3, and his most recent report from Shiloh confirms his progress. There are of course certain aspects in which Chris still experiences difficulty. His handwriting needs some more practice, although there has been a big improvement. When he focuses on writing neatly, he can write beautifully, but he needs some reminding to do so from time to time. There are days when he can get quite emotional about small things and then seems less motivated for school and learning. We need to teach him some more interpersonal and self-motivation skills.